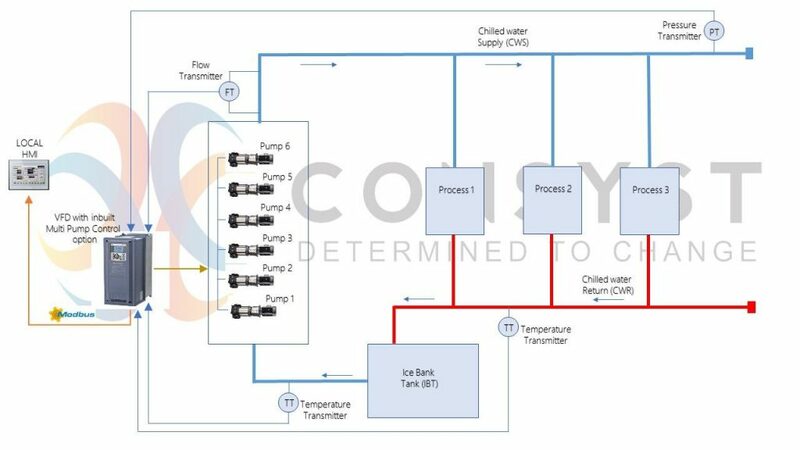 Customer had a requirement of a system that should circulate chilled water and maintain a specific product temperature at the various processes with minimum expenditure of electrical energy to operate the pump motors. The chilled water stored in the IBT (Ice Bank Tank) should be circulated through 150 mm diameter pipe for distributing to various PHE (Plate Heat Exchanger) for chilling milk to 4 Deg.C. The peak requirement of chilled water will be 150,000 LPH. The old system was running with two 10 HP pumps and one 15 HP pump to maintain 6 Kg/cm2 Pressure. It had limitations since all motors were under manual control which resulted in energy loss. It had limited flow control since no proper feedback of flow and temperature was received. Also there was energy loss for chilled water circulation at off peak time. The solution provided includes smart and intelligent control with touch screen-based user interface. It has total 6 pumps in total rated 7.5 HP. The pumps are controlled with combination of inverter drive and commercial drive using the Algorithm built in to the FUJI Electric FRENIC AQUA Series VFD utilizing two PID Control Loops from the available four loops. The system is configured by combining the motor driven by the inverter, motors that are commercially driven and auxiliary motor. The motor driven by the inverter is always fixed. Motors commercially driven are added one by one in control when the required discharge flow rate cannot be achieved with the inverter driven motor only. By implementing this system, the current demand is nearly 70% of the earlier demand. This influenced the power consumption and helped Customer to save on energy charges. By maintaining the temperature constant, consistent product quality was ensured. Hence customer is proving its commitment to the environment and future generation.